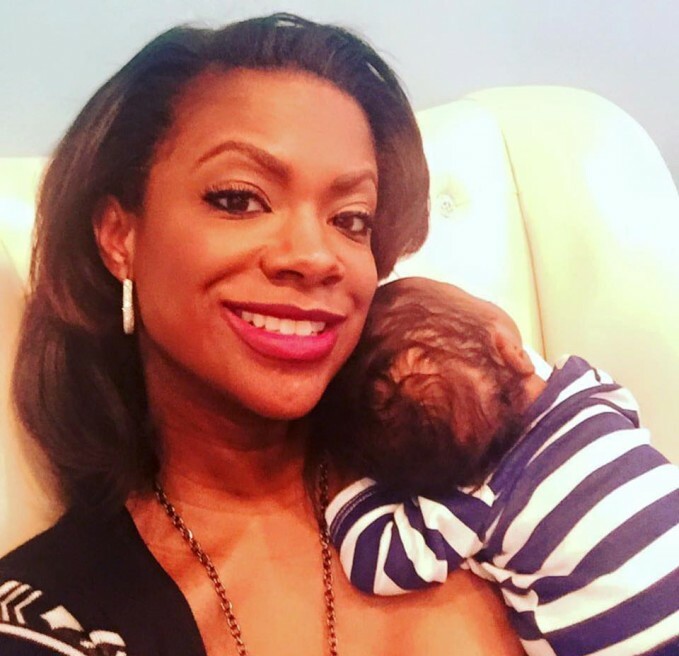 Grammy winning songwriter, and Real Housewives of Atlanta star, Kandi Burruss gave birth to a baby boy on January 6, 2016. She has since shared a few photos of her nursing journey on Instagram. She shared this short video of her pumping in the car prior to going into the restaurant for dinner with her baby. While every mother should absolutely be supported in nursing anytime, anywhere if Kandi’s comfort level involves pumping to use a bottle in public it’s great she’s able to do that. Her husband, Todd, can be heard encouraging her to “get your pump on”. The support of your partner is an underestimated need in a successful nursing relationship. A few days earlier she shared a photo of her nursing mid-hair appointment. She had soap in her hair, leaned over the sink still when little Ace got hungry. Kandi wasted no time giving him what he needed. You see her shirt lifted and Ace comfy on his mom while she continues getting her hair done. It sums up motherhood perfectly. There’s not much we can’t multi-task, especially when baby gets hungry. In her true Kandi Burruss fashion, she let’s everyone know how little she cares about the naysayers. Kandi is certainly not the first celebrity we’ve talked about who has consciously, or unconsciously, become a part of the movement to normalize breastfeeding but Kandi’s support and star power is very appreciated. African American women have one of the lowest rates of breastfeeding among any group of women in the US. According to the CDC, only 59% of black mothers initiated breastfeeding in 2008, as compared to 75% of white mothers and 80% of Hispanic moms. There has been a lack of support and visibility within the community. The more black moms who are open about breastfeeding their babies the more help there is to normalize nursing and to raise rates and acceptance. Kandi’s level of visibility and her celebrity status can only lend a helping hand.